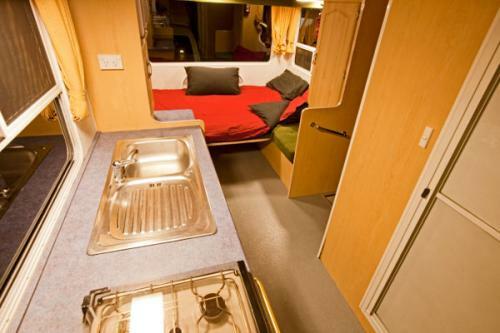 Be impressed by this fully self contained and reasonably cheap New Zealand motorhome. 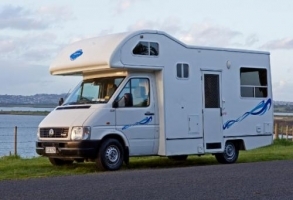 The Wendekreisen budget 4 berth offers shower and toilet facilities, hot & cold running water, LPG gas heating, a dual power fridge and gas cooking facilities with a microwave. All in all, this motorhome guarantees independence and allows for comfortable living and sleeping space for up to 4 adults. The convenient walkthrough from the driver's cabin to the living area allows for easy access to the rear. Large rear windows ensure great panoramic views. If you like that little bit of extra space at a cheap price, the 4 berth budget motorhome is the perfect way to explore New Zealand. 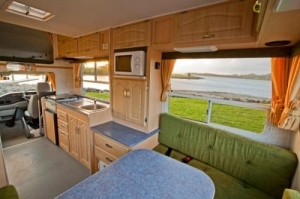 This motorhome is certified self contained in accordance with New Zealand Standard 5465:2001. Fuel consumption: 10.8 litre/100 km approx.